The country is a parliamentary republic, and the president has few executive powers. A vocal pro-Russian president may make the country’s pro-European course appear in jeopardy, but has little real recourse to change it. A polling station in Moldova’s capital of Chișinău. Photo (c): Maxim Edwards. All rights reserved. The Party of Socialists’ Igor Dodon beat challenger Maia Sandu in a runoff vote on Sunday, with 52.3% of the vote to 47.7% for his pro-European rival. Dodon is known for his pro-Russian statements, promising to rule “like Putin”, and declaring that Crimea is Russian territory (with no hint of disapproval). A cursory look at his campaign literature and his record hits all the pro-Russian talking points — defence of Orthodoxy and “traditional family values”, plus a firm strategic partnership with Russia. His campaign also plays on minorities’ fears of reunion with neighbouring Romania, a marginal but old bugbear in Moldovan politics. With this pedigree, it’s no surprise that pundits overseas have raised the alarm of a “victory for Putin”. They clearly haven’t heard of Vlad Plahotniuc, Moldova’s most powerful man and most hated politician. These elections were a symbolic concession to protesters enraged at the corruption and graft of successive Moldovan governments, which culminated in the theft of $1 billion from three banks. They were the country’s first direct presidential elections in 20 years, though this well-merited disillusionment has taken its toll. Only 49% of eligible voters turned out for the first round on 30 October, and 53% on Sunday. In fact, it was surprising that Dodon and Sandu faced off at all. Two of Sandu’s competitors, the protest leader Andrei Năstase, and Democratic Party candidate Marian Lupu, withdrew from the presidential race in mid-October. Sandu, a former education minister and Harvard-educated economist, was thrust into the limelight — and became the candidate of choice for Moldova’s pro-European and anti-oligarchic electorate. But many Moldovans are tired of new kids on the block and their bold promises. “There comes a time”, I was told on the streets of Chișinău, “when you don’t know who to trust anymore”. It was a phrase I heard in many variations during my stay in Moldova. Dodon is a more familiar face than Sandu, which proved both a help and a hindrance — Moldovans know what he stands for, and who he stands against. The 41 year old president-elect served as a minister of economics and vice-president under the Communist government of Vladimir Voronin (which ruled from 2001-2009). Dodon left the communists and joined the socialists in 2011, and was soon elected chairman of the party. His former colleagues nurtured grudges; the ailing communist party boycotted the election. However, Dodon gained the support of his erstwhile rival Renato Usatii, whose candidate Ciubașcenco took 6% of the vote in the first round. Voting patterns were similar, with the north and south of the country voted strongly for Dodon, and historically pro-Russian autonomous region Gagauzia giving him 99%. The breakaway region of Transnistria played a part, too — over 16,000 Moldovan citizens living there cast votes, the vast majority probably for Dodon. In its preliminary report, the OSCE has ruled the elections to be largely free and fair, though a polarised media environment and opaque party finances remained a problem. A number of polling stations overseas also ran out of ballots — one of several reasons why Maia Sandu has called on the head of the electoral commission to resign, and has threatened to challenge the result in court. Supporters of Sandu have taken to the streets of Chișinău in recent days. Dodon insists that the result was fair, that he is staying put, and warned them yesterday “not to play with fire”. Days before the election saw Dodon change tack, softening his message in a bid to be a “president for all Moldovans”, and that he’d “never be anti-Romanian or anti-European”. He claimed he’d keep Moldova’s visa-free agreement with the EU (Moldova signed an association agreement in 2014). It was risky promise to make, particularly after previous enthusiasm for joining the Russian-led Eurasian Economic Union. But Dodon’s bark is worse than his bite. The country is a parliamentary republic, and the president has few executive powers — he can send legislation back to parliament for a second reading, and appoint members of the security council. He can also call an advisory referendum on “issues of national importance”, and meet with foreign heads of state. These are important symbolic powers, but few analysts seriously believe they are enough to turn Moldova’s pro-European orientation on its head. For a start, the parliamentary majority is informally controlled by the oligarch Vladimir Plahotniuc, who presents himself as the most reliable pro-European force and a necessary evil for western backers. A Dodon presidency may suit him just fine. Plahotniuc realises that western partners are compelled to court him. A Sandu victory would have deprived him of this role, creating a political grouping of resolutely anti-oligarchic, but pro-European, players. Should his key contact Victoria Nuland leave the State Department under a Trump presidency, he could be weakened further still. Furthermore, a vocal pro-Russian president could make the country’s pro-European course appear in jeopardy, while having little real recourse to change it. The pro-Russian electorate would feel appeased (to an extent), while their president can do little to make good on his promises. Dodon also has a longer history in Moldovan politics. He understands its ebb and flow, and is less likely to burn bridges with future allies for the sake of anticorruption campaigns. Indeed, there’s some speculation that his defection from the communist party in 2011 was Plahotniuc’s doing — so as to ensure enough deputies voted for his preferred president (and avoid snap parliamentary elections to resolve the impasse). Sandu’s candidacy appeared to worry Plahotniuc — once the failings of his candidate of choice Marian Lupu became clear, he hedged his bets with Dodon. Nevertheless, as a nominally pro-European politician, Plahotniuc had to give Sandu the pretence of support. But public praise from a figure with an anti-rating of over 92% proved a poisoned chalice. As a result, both candidates accused each other of being in the oligarch’s pocket during presidential debates. It was an unedifying sight, given the hopes for a brave new politics. But it’s not as though these were baseless slurs: we could ask why Dodon has flown several times on board a private aeroplane owned by Plahotniuc. As minister of economics during the communist government, he helped to privatise the Codru hotel in central Chișinău — which was then sold to Plahotniuc for a quarter of the market price. Moldova is an impoverished and deeply unequal country. Its people have an appetite for change, but after years of governments promising and stalling reforms, they’ve been left hungry. Geopolitics doesn’t explain it all. Instead, it’s a conditioning factor in which local actors have considerable room for self-interested manoeuvring. Teetering on a geopolitical rift, Moldova’s elites have become adept at playing off east and west to their own advantage — and their pro-European preferences prove fickle indeed. The consequences for these elections lie further down the road. 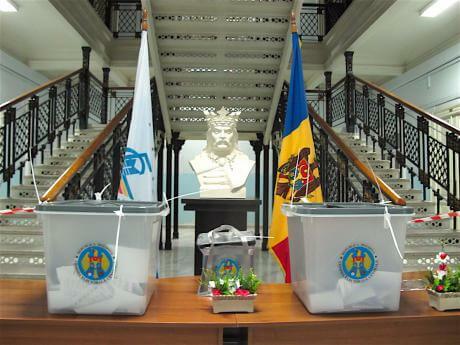 In 2018, Moldova will hold parliamentary elections. A socialist presidency will help build momentum and administrative competence for the coming contest. Moldova’s most powerful man knows which way the wind blows. Once a key funder of the country’s communist government, he was easily able to transition to new political realities after 2009. Vlad Plahotniuc now has two years to build a collegiate relationship with Dodon and his team, so as to preserve his influence should the socialists win a parliamentary majority in two years time. That could spell a real shift towards Russia’s orbit. And then, we could talk of a victory for Putin. In either case, the Moldovan people are still waiting for theirs. Maxim Edwards is Commissioning Editor at openDemocracy Russia. He writes on nationalism, migration, minorities and memory, with a focus on post-Soviet countries. His articles have appeared in Al-Jazeera, Al Monitor, Souciant and the Forward among other publications.